The 25 Hostel i Songkhla, Thailand: Reservér nu! The 25 Hostel is located at the center of Hat Yai Town, where is famous destination for food and shopping. 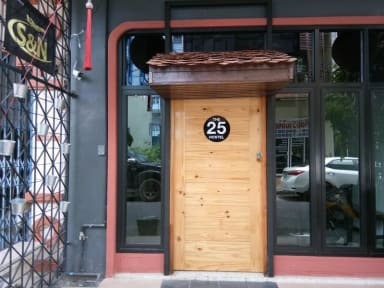 The 25 Hostel is highly recommended for backpackers who want to get an affordable stay yet comfortable at the same time. The 25 Hostel provides decent accommodation, facilities as well as great services. The 25 Hostel has provided male dormitory and female dormitory. Another room type the hostel has provided is mixed dormitory with Fan. The 25 hostel have free WiFi which is featured throughout the property. The 25 Hostel also provides housekeeping, luggage storage, towel for hire, a refrigerator, lockers and reading light. 2. Check in from 14:00 to 20:00.